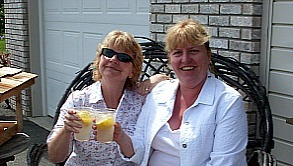 Here is a picture of me with friend Karen aka “Dovey”. We have had these nicknames with each other for years and now even my daughter is “Little Lovey”. Great friendships are truly vitamins for the soul! Karen and I do not see each other often, but when we do it’s a whole lot of laughter, light heartedness and just pure joy. This picture was taken last summer when we went on a garden tour together. At the end of the tour we purchased some homemade lemonade and enjoyed the refreshment of both the drink and our being together once again in friendship. Friendships are so important. Do you have a friend that you haven’t connected with in a while? Why not pick up the phone right now and call or text them and suggest a get together? I once read that one of the top regrets people have at the end of their lives is that they lost contact with friends and this was something that they truly regretted. I love, honor, and cherish my friend “Dovey” and thank her from the bottom of my heart for being in my life. I wish everyone friendships that make you smile and bring you bliss, joy and lots of sunshine!